Agriculture is the backbone of the American economy. Nowhere is that more evident than right here in the state of Minnesota. As the nation’s top producer of turkey, sugar beets, oats, sweet corn, and green peas, and a leader in soybean and corn production, Minnesota is recognized as an agricultural leader throughout the world. Congress plays a significant role in the modernization of American farming by actively engaging in the creation of sound agriculture and land stewardship policies. I will work to promote this vital industry and ensure that our farmers have the resources they need for effective and safe production of America’s food supply. Legislation includes Emmer’s STRESS Act to combat farmer suicide, provisions to improve dairy risk management tools, and provides funding for livestock disease prevention. 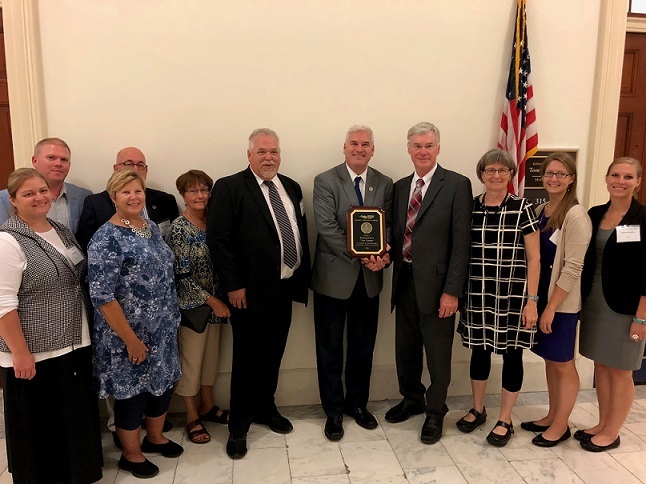 WASHINGTON, DC - National Farmers Union (NFU) recognized Congressman Tom Emmer (MN-06) with the Golden Triangle Award, the family farm organization’s highest legislative honor, for his leadership and support at the federal policymaking level for family farmers, ranchers and their rural communities. WASHINGTON, DC - Today Congressman Tom Emmer (MN-06) joined Joe Gill on KASM Radio Network to weigh in on the ongoing trade disputes between the United States and China, as well as give an update on the status of this year's Farm Bill. Washington, D.C. – Last night, Congressman Tom Emmer (MN-06) urged members of Congress to support our nation's farmers by taking action on his Stemming the Tide of Rural Economic Stress and Suicide (STRESS) Act (H.R.